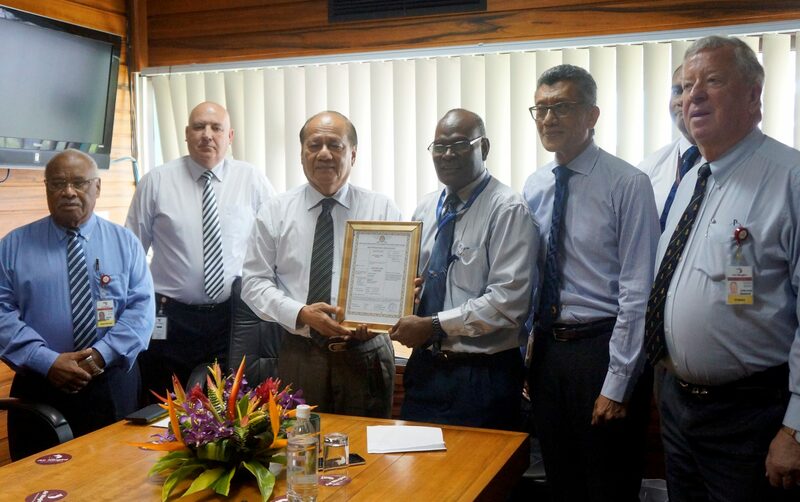 Air Niugini has received an Air Operator’s Certificate (AOC) from the PNG Civil Aviation Authority today (Wednesday 29th June) to extend its operations for another five years. This certificate confirms that Air Niugini has again successfully met all regulatory safety standards and requirements, set by CASA PNG and the Civil Aviation Act. The Chairman of the Board of Air Niugini, Sir Frederick Reiher, who received the AOC Certificate from PNG CASA Managing Director Wilson Sagati said the certificate reflects the continued success of the airline’s commitment to maintaining the highest possible safety standards across all the airlines operations. “This certificate also reflects the regulator’s confidence in the airline as Air Niugini implements the most significant fleet upgrading program in its 42 year history, so the airline can operate with maximum efficiency, and safety, utilizing aircraft best suited to the needs of domestic, regional passengers and commercial customers,” Sir Frederick said. He commended Air Niugini executive management team and all staff on the granting of the AOC license for a further five years. To obtain an Airline Operating Certificate from a regulatory authority, the operators have to demonstrate that they have fully- trained and qualified personnel, infrastructure, systems, processes and procedures in place to ensure the safety of the general public and its employees both on the ground and in the air. Air Niugini’s AOC now has allowed the airline to operate for the next five years before it is reviewed, however between now and the next five years, there are other regulatory safety standards and requirements that the airline is expected to adhere to and they will be given the same high priority as securing the AOC. Air Niugini operates the most extensive network of any airline in Papua New Guinea, and the Pacific Islands Region. Sir Frederick said “It is important to stress that a significant number of the routes serviced by Air Niugini are unprofitable, and these and all services are maintained without any reduction in safety standards or the quality of the service provided to passengers,”. “Air Niugini is well placed not just to meet the challenges ahead, but also the opportunities that are available as the nation grows, and as Papua New Guinea’s regional standing expands,” Sir Frederick concluded.